It's been a busy week of hobby in the studio, this week I built and painted a Taurox to use as a command vehicle, I also built a Wyvern for some artillary support and tossed together a bit of plastic and scraps for a new terrain piece! 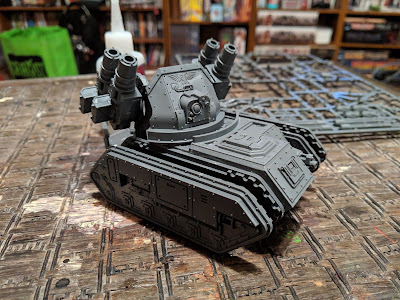 Wednesday's game taught me that I needed more covering fire and a distraction from my Leman Russ tanks. Enter the Wyvern and its mortar shots that can target anything on the board up to 48" away without seeing it. This baby will act as a backfield objective camper while also supplying covering fire to my boys. 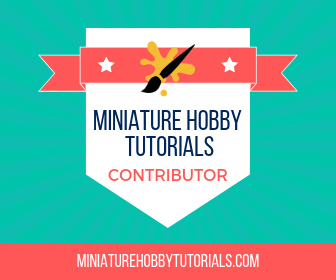 I still need to come up with some models for the gunner and spotter. But that's going to have to wait for now. 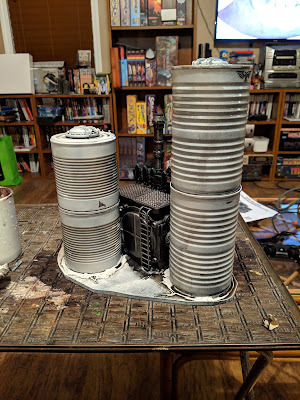 It is no secret that I love building tin can terrain. I've done cans by themselves, as well as a pump station out of them. Since about November last year I had an idea for a new piece using an old LP gas valve from my furnace. But I couldn't hammer out the look that I wanted. 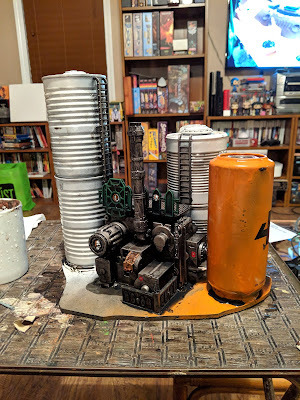 Originally the plan was to include a walkway on it to connect to the other Sector Mechanicus walkways I have. But after playing with it for a bit, it wasn't really jiving. By this time I had a decent collection of different size cans to mess with. So I took a pair of corn cans and some Campbell's Chunky soup cans, as well as a Monster energy drink can and went to work. Most of the first half hour or more was spent trying to figure out a new layout on the board I had pre-cut to include the walkway. Once that was settled, I started gluing bits together. In hindsight, I should have painted the silos before gluing them down. But, when you're deep in the groove it's hard to pull away and subassemble. 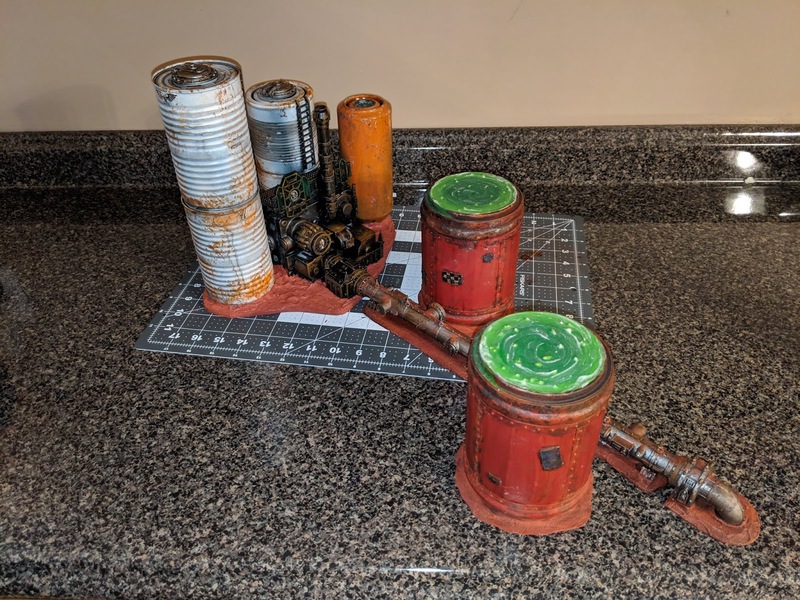 Once the main spray painting was done, and the pump itself was touched up, I got to painting it and then adding details. 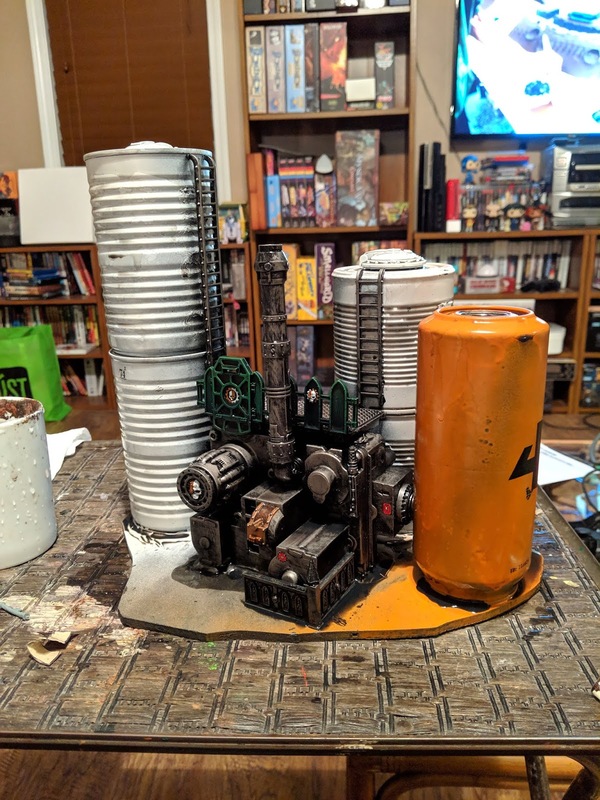 It was then washed with Nuln Oil and left to dry overnight. So far I'm really pleased with it. 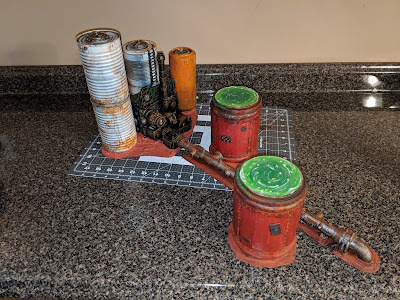 I still need to paint up a control panel that ties into the Promethium Relay Pipes and then do some weathering and basing. I had hoped to get it finished for tonight's gaming session. But that didn't happen. 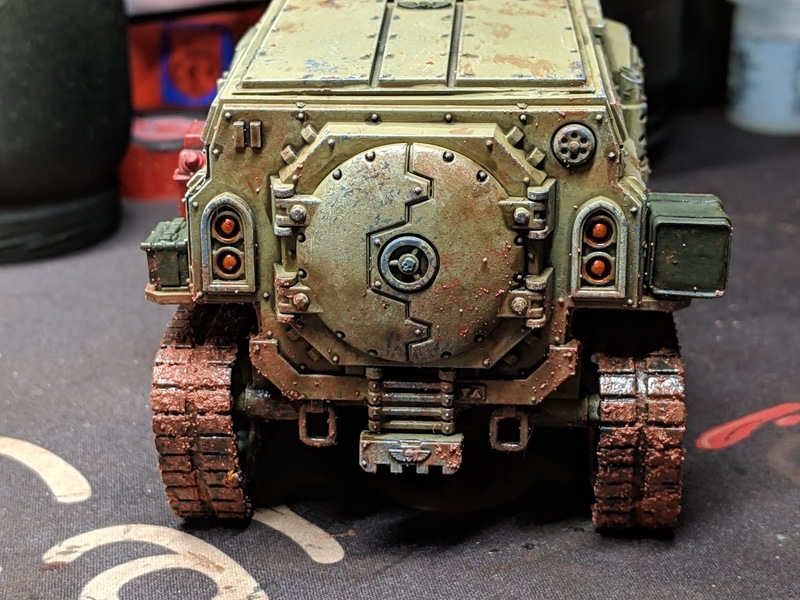 I still need to finish off the base with washes and do some weathering pigments. But it's in a playable state now. So I will be taking it with me anyway, because it's flippin awesome. Every Commander of a mechanized infantry unit needs a sweet ride. 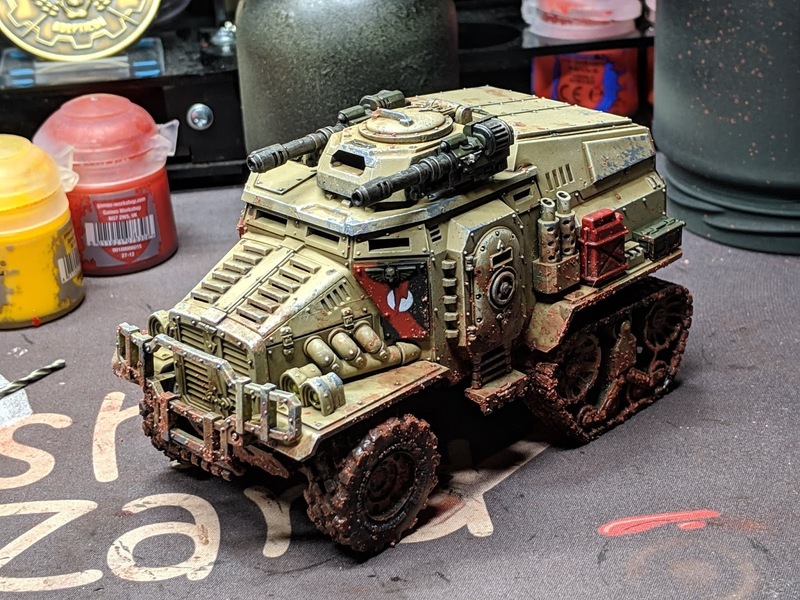 For my Company Commander I decided to toss him into a Taurox. But I hate the original tracks that are on it. This problem was solved, thanks to an upgrade kit from Zinge Industries. This half-track kit is amazing and completely transforms the Taurox into a better looking vehicle. Nothing against the sculptor or lorecrafter who came up with the Taurox, but this is what the vehicle should have looked like to begin with. When it came time to paint it, I was unsure on how to proceed. Do I go single color, or camo to match the tanks? 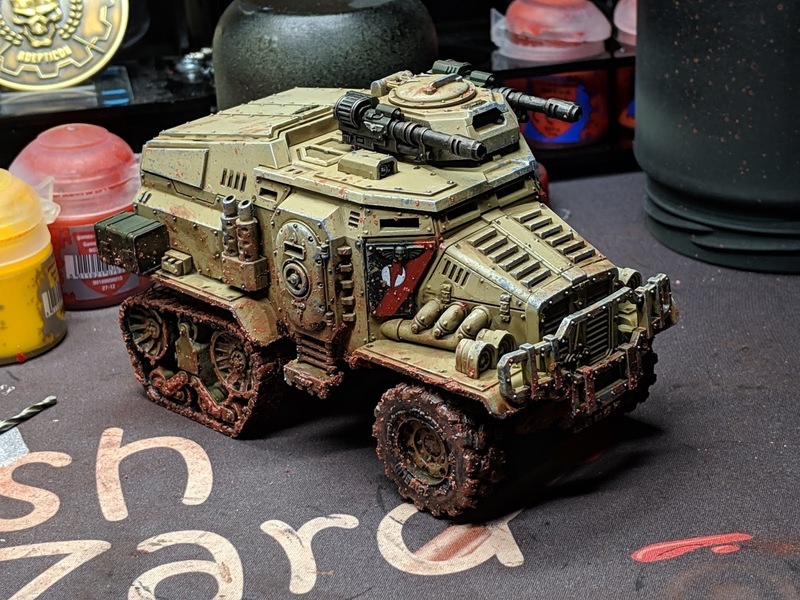 After talking with some friends about it, I decided on single color and going with Zandri Dust to match the base color of the tanks and coats of the troopers. 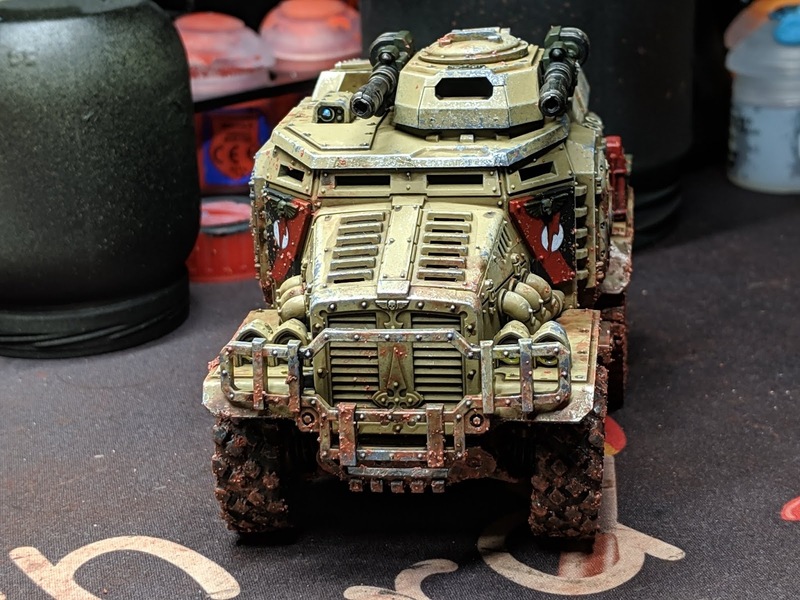 In true military fashion, I painted 99% of the model in Zandri Dust, but broke it up with some accessories and painted the autocannons metal. Before the wheels and tracks were added, I muddied up the undercarriage and the tracks/wheels with texture paint and gave it an Agrax wash.
Once that was dry, I glued on the running gear and started dirtying up the entire vehicle by splattering it with texture paint flung from a toothbrush. From there I used an old brush ans stippled texture paint all over the splattered areas and on other spots to make it look well used in rough conditions. Overall, I love how this model turned out. I am tempted to add a communications array to it somewhere though. Because this is meant to be a command vehicle and my warlord trait lets him give orders from it. Tonight is my next game with the Steel Legion. We are playing a 1500 point game and I am taking some allied Admech to fill out my points.